What Does It Take to Recover from Abuse? There are many human beings on this planet who have endured abuse and neglect. Common knowledge asserts in response to their pain that if you are still alive, you will recover by some natural, internal process determined by your character traits, notably a trait called “resilience”. Some people do indeed “buck up” and “move on,” at least they appear to have recovered. Many more live shortened lives distorted by the painful residuals of what happened in the past. In recent decades there has been an effort in the healing and scientific community to figure out something that works better than putting the task of recovery back on those who have suffered. While many talented, interested people have contributed to a better understanding of recovery, we refer here to published work done by Judith Herman, M.D., Bessel van der Kolk, M.D., and Peter Levine, Ph.D. Dr. Levine’s work also connects with healing traditions from older cultures where shamans and the human community did the recovery work we now expect from victims themselves, guided by doctors and therapists. Isn’t recovery a personal quest, defined differently by each person? It certainly is personal because abuse and neglect* are directed at you personally, unlike natural devastation generated by large impersonal forces like storms and wars. Abuse works because it upsets our biology by distorting or denying the things we need to keep mind, body and spirit healthy. Physical: Starving, beating, restraining, taking away housing, money, jobs, etc. Psychological: Isolation, humiliation, subjugation, preventing education or consistent loving relationships, etc. Spiritual: Persecution, prejudice and discrimination, unreasonable demands and blame, etc. reconnecting with yourself and with others – being able to accept and give love and care again. The “personal” in this process is the part where you control how and when and with whom you work on recovery. It doesn’t mean you do it alone. Reconnecting is all about including others. Safety, remembering, and reconnecting are both private and inclusive of others, including animals. The drawing below (based on Judith Herman’s work) is a reminder that this is not a linear, “check off the box and move on to the next thing” process. It seems to work out best as a “little of this, little of that as tolerated” cycle. Every small success makes tackling the other aspects easier. Where do willpower and character play a part in recovery? They don’t. While none of these components is going to happen without your cooperation, you can’t will yourself into recovery any more than you can will yourself to get over the flu faster. Positive thinking has its place, but it is not a way to recover from abuse. Denial, and the always popular “not talking about it,” lets the consequences of abuse roll on under the surface, affecting everyone in its path. Recovery in this model (which is based on examining the actual recovery process of thousands of survivors of abuse) is about doing, in small steps, the actions and mental shifts that hit one or more of these three marks, over and over again. Abuse doesn’t break a person down in a day; recovery takes time too. What about resilience? Resilience is currently understood as what you have in your past that can help you re-establish safety, remembering, and reconnecting. If you had a secure childhood, it helps your recovery from adult abuse because you have a baseline to which you can refer. Fortunately, you can build resilience for the future by going through the recovery process. Avoiding recovery consumes whatever resilience you had, and leaves you depleted and vulnerable to any future stress. Even normal things like aging, illness, changes in circumstance are more destabilizing if they are piled on a life already depleted by abuse without complete recovery, which includes all 3 elements. What now? Read books by Herman, van der Kolk, and Levine, visit their websites for videos, classes, therapists who carry on their work with clients (using the links in the third paragraph above). 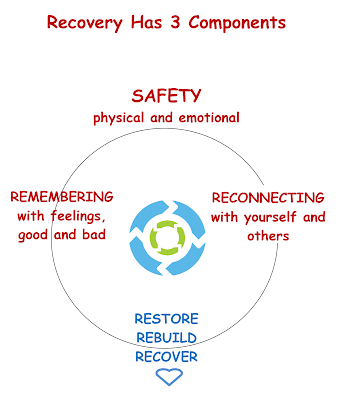 Building your recovery around these components has worked for many many people.